Wine And Cheese Pairing, An Adventure In Flavors! Wine and cheese pairing should be as effortless as matching earthy black truffles to a 7-egg omelet, or hot dogs and beer for that matter. The pairing must make sense to the palate, and elevate the dining experience. But sometimes it can be tricky. One difficulty in creating successful pairings of wine and cheeses occurs when there is unfamiliarity with the individual tastes and flavors, not to mention the cheer variety of wines and cheeses available to us. This can be solved by experimentation, educating your palate. One strategy is to select wines and cheeses from one region. For example, you may want to include a pairing of Chianti wine with a cheese from the region, or try a Rioja wine with Manchego cheese. Another strategy is to consider the texture of the cheese. 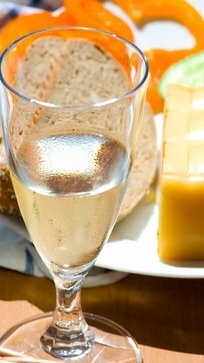 Cheeses with washed rinds include Epoisses and Chaumes; they will work well when pairing with medium-bodied, sweeter wine such as a Muscato. Hard cheeses such as Extra Sharp Cheddars, Parmesan and Asiago are able to stand up to wines that have high tannin concentrations, while Brie and other soft cheese varieties are enhanced when paired with a more acidic wine such as a Sauvignon Blanc. Remember that wine and cheese pairing choices can be selected based on similarities or contrasts in flavors. 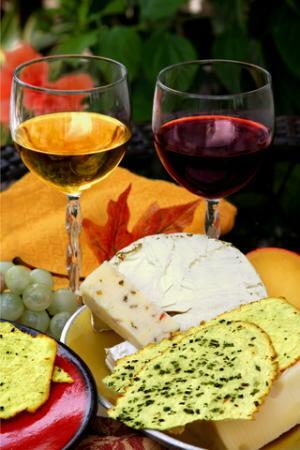 An example of matching similar flavors is seen when a tart, crisp wine is paired with a cheese that has tangy, acidic qualities, such as goat cheese. To provide a contrast in your wine and cheese pairing you could match a sweet wine with a sharply, pungent cheese. Mulled wine is a staple during the winter months. You can serve this wine with Roquefort. I full-bodied Port will be great with a nice blue cheese. Most Cabernets are full bodied with lots of tannins. Soft, creamy cheese will balance the strong tannins in the wine. Merlots are versatile wines with less tannin than Cabernet Sauvignon. Their flavors can be lightly delicate and simple or bold and amazingly complex. The usual notes are those of chocolate, plums, and cherries.You can pair Merlot with an Alpine style cheese, and younger wash rind cheeses. .
Zinfandel wines have fruity and spicy notes. Salty cheeses such as one of the blue cheese varieties provide a perfect counterpoint to balance the fruity qualities of these wines..
Syrah is generally described as a soft to medium bodied wine. It contains complex notes of smoke, berries, and even roasted peppers. You can create a splendid wine and cheese pairing with a Syrah and British farmhouse cheddars. Sauvignon Blanc has herbal notes and refreshing acidity. The acidity of the wine will match well with a cheese made from goat’s milk. With Champagne or sparkling wine, try a rich and creamy cheese. A soft Brie will be wonderful, or you can also try a Gouda. Like everything else in the wine-food pairing world there are no hard and fast rules. Experimentation is the name of the game. These are some basic guidelines that can provide you with a starting point, but the final choices are up to you. Remember, if it tastes good to you, then it works. Now You Are Ready to Begin Your Wine and Cheese Pairing Experience!